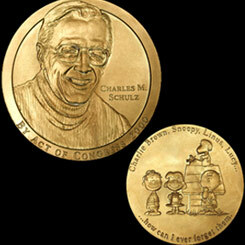 Courtesy of the Charles M. Schulz Museum and Research Center, Santa Rosa, California The Charles Schulz Congressional Gold Medal featured the likeness of Schulz on the front and the Peanuts gang displayed on the reverse. On this date, President William Jefferson Clinton signed a bill passed by Congress to posthumously award Charles M. Schulz the Congressional Gold Medal—the highest expression of national appreciation by Congress for distinguished achievements and contributions. Born on November 26, 1922, Charles Schulz earned international fame for his comic strip, “Peanuts.” Michael Thompson of California introduced the measure in the House on February 10, 2000, two days before Schulz succumbed to cancer at his California home. Numerous Representatives took to the House Floor to praise Schulz for his 50-year career during which his renowned cast of characters—Snoopy, Charlie Brown, Lucy, and Linus—appeared in a widely syndicated comic strip, as well as many books, TV specials, and movies. “Peanuts was both a national treasure and a national delight,” John LaFalce of New York remarked. On February 15, 2000, the House overwhelmingly passed the measure with only one dissenting vote. The final text of the legislation signed by President Clinton later that June read, in part: “Charles M. Schulz gave the Nation a unique sense of optimism, purpose, and pride. Whether through the Great Pumpkin Patch, the Kite Eating Tree, Lucy’s Psychiatric Help Stand, or Snoopy’s adventures with the Red Baron, ‘Peanuts’ embodied human vulnerabilities, emotions, and potential.” Almost one year after the bill became law, Congress formally recognized Schulz’s achievements during the 107th Congress (2001–2003), by presenting the Congressional Gold Medal to his family in a ceremony in the Capitol Rotunda. “He would have felt an amazingly strong sense of pride and accomplishment knowing that he had been recognized for his important impact on American society,” his widow Jeannie Schulz observed.